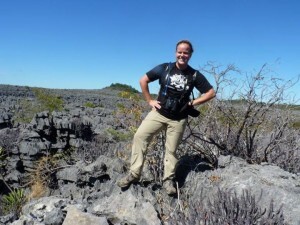 Haley and the tsingy landscape of the Ankarana National Park. Haley Randell joins us this week as our featured researcher! 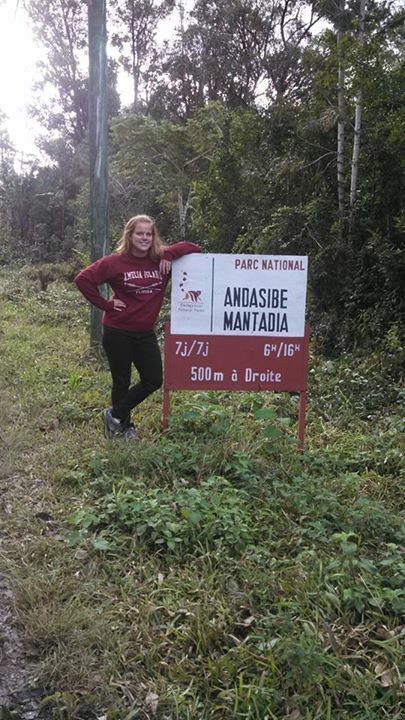 Haley has investigated fatal bird-surface collisions in urban areas and the absence of lemur populations outside protected areas in Madagascar. She is currently finishing her Master’s degree at Arizona State University, following the completion of her Bachelors of Science from Temple University. 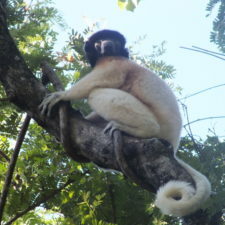 Haley can be contacted at haley.gilles@gmail.com; more information about her travels in Madagascar can be found on her blog at https://hales23trails.wordpress.com/. I’m a certified redhead from suburban Connecticut with parents from meat-and-potatoes, small-town Ohio. 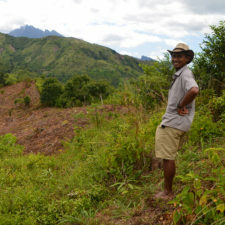 There was no way I could have ever known what to expect from my journey as a researcher working in Madagascar. 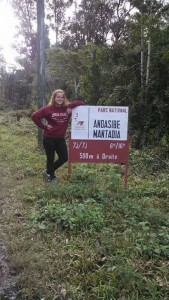 Haley visiting the Andasibe park in Madagascar. Although it’s been almost two years since I started – and ended – my adventure in Madagascar, people still ask me what it was like…and I still don’t know how to answer. It was breathtaking, depressing, difficult, inspiring, and lonely; the emotional roller coaster was pretty all-encompassing. On the one hand, I want to tell everyone to go visit and see the lemurs, baobab trees, and engage with the locals; on other the hand, I know it’s just not that easy. In Madagascar, it’s not exactly easy to travel off the beaten path. I arrived in Madagascar expecting the unexpected and that is exactly what I got. I went over to the hot, dusty island of Madagascar for May, June, and July in 2013 to work on three projects for three different organizations. The first job – and most traditional “hard science” data collection project – was as an assistant on a pilot field season for a biologist at Temple University. 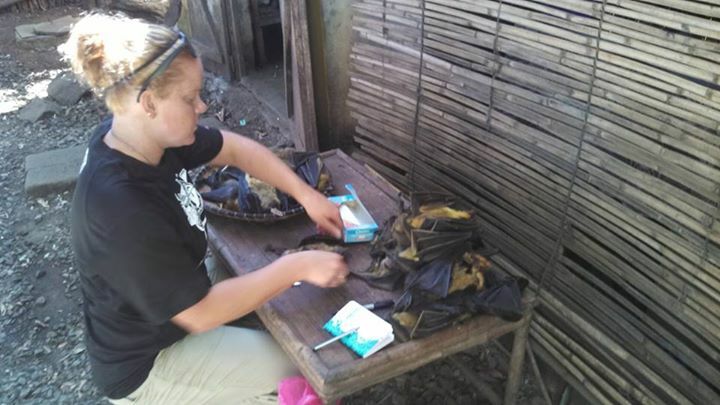 Working in the Ankarana National Park, we searched for ficus trees, other sites where frugivores (lemurs, bats, and birds) might eat, and field tested various experiments. With just a few of us on the research team, we were always doing something new and trying different techniques which was super exciting and intellectually stimulating. 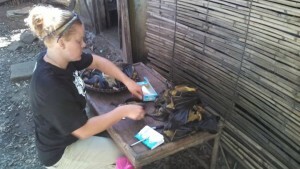 Haley collecting hair samples from bushmeat in northern Madagascar. During this time, I often worked with a research team at sunset, as we would monitor a fruit-bearing tree for a few hours before and after sunset to record the activity of fruit-eating bats, birds, and lemurs. Working into the night meant that we would have to walk the roughly 30 minute hike back to our huts in almost pitch black conditions. We knew the way back – and there weren’t any big predators to be concerned with – so this became my favorite time to look for wildlife, spiders, and lemurs in particular. Imagine walking through a dark forest and looking up to see tiny colorful eyes staring back at you. Sounds creepy, right? I could really look at the reflective colors of the eyes; each set was a different shade of purple, blue, green, pink and every other color imaginable! 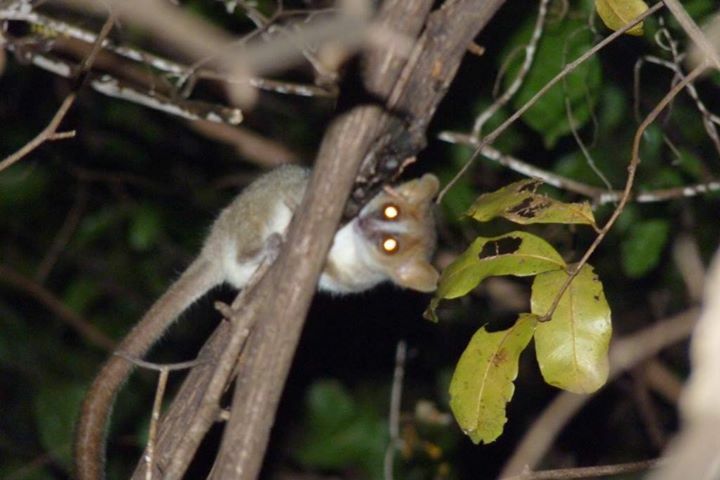 Not only were there tiny eyes guiding the way out of the forest, if you were lucky you would see a nocturnal lemur peaking down at you as well! Mouse lemur hanging out in a tree after sunset in the Ankarana National Park. The second project – which I actually only participated in for a couple days, due to a reoccurring rolling ankle – involved surveying university-aged adults in Antsiranana (northern Madagascar) about their sexual health knowledge. The results literally blew my mind; talking to university students about their belief – or disbelief – in sexually transmitted diseases really highlighted the complexities of international development. Not only did this experience allow me an incredible insight into Malagasy culture, but to actually visit the dorms and see how these young adults live and study was – to be frank – terrifying. Personally, I can’t focus when my chair in the computer lab is too uncomfortable…but in that Malagasy university, students had to study in their dorm rooms with four other people cooking, eating, and children running around. 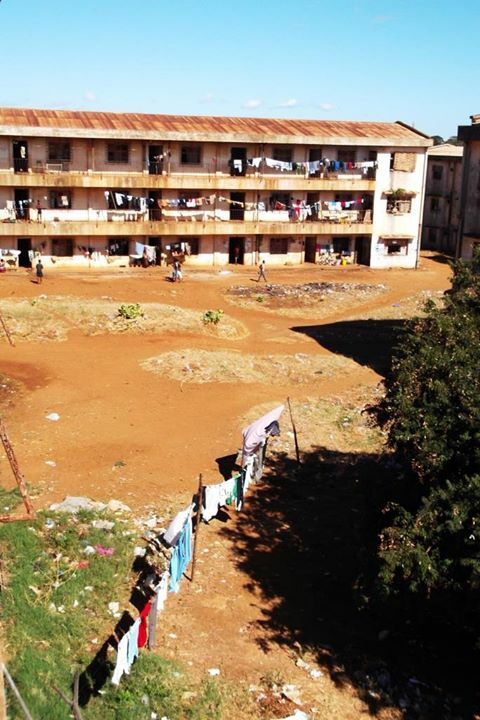 How can the Malagasy education system improve if there isn’t even enough funding to fix broken toilets or build more dorms? These are the types of questions that I started to ask myself while working in Madagascar…and the more I traveled through the country, the more questions I had. The University of Antsiranana in northern Madagascar. The third and final project I worked on was the one that took most of my time and patience. Together with another researcher and Malagasy translator, I worked to interview villagers surrounding national parks in the north about their diets and natural resource use. In addition to facilitating these interviews, I managed a small project which attempted to survey lemur populations on the perimeter of the Ankarana National Park (Page 27, Lemur News 2014). 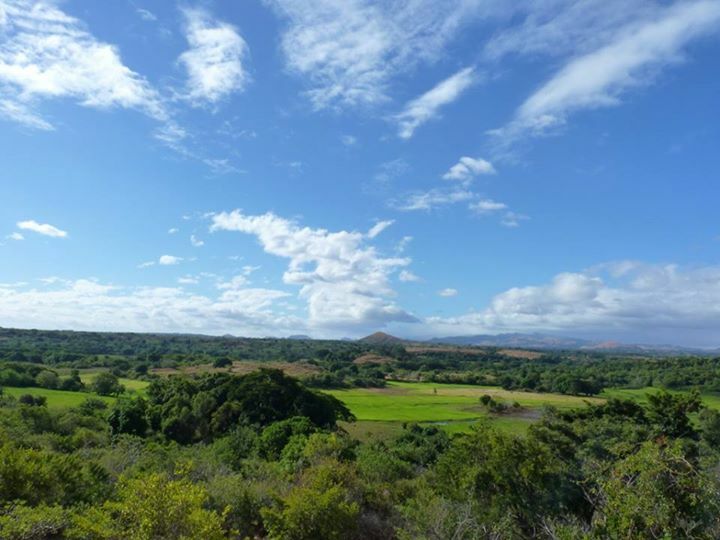 Unfortunately, this project didn’t go too well because we didn’t see any wild lemurs at all; I literally surveyed 36 kilometers of trails and never saw one wild lemur outside the national park boundaries. However, during my walks along the perimeter of the park, I did see a lot of tree harvesting from inside the park with no apparent objection from the park service. Landscape surrounding the Ankarana National Park. The lack of lemurs – and other wild animals – in areas that weren’t protected was the hardest pill to swallow. 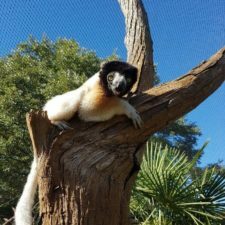 I’m a solutions oriented girl and trying to find solutions that will conserve lemurs is not something a handful of people with grant money will be able to accomplish. How do you attempt to re-forest the country when officials aren’t financially supported or not enforcing the rules? If tourism drops, who will pay for rehabilitation of habitats? It will take community based approaches with the financial and moral support of the government. 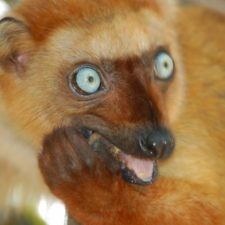 Is this something that will happen before the lemurs are past the point of extinction?